Below are 3 separate activities that may exist in a blended learning environment for a lesson on-what else? BLENDED LEARNING. The icons in each section, indicate the group setting, independent work, paired activity , or collaborative group (teacher-led). Through differentiating the tasks, a blended classroom allows for students to meet lesson objectives in an environment and platform that works for them. Which activity works for you? Working in our collaborative learning group, let's process our thinking about blended learning and its impact on our students. Click here to contribute to our group's learning. Based on our students' needs, what blended learning model can be most effective? What does this blended learning model look like? Using paper, draw a model of this blended learning model OR go to our group's Stoodle, and map it out. After reviewing resources found on LEARN and RESOURCES page, review any of the following case studies, and collaborate with a partner on how to best help this teacher move this teacher forward in creating his/her blended learning classroom. Please read the information about the teacher, and overview of his/her present environment, mindset and skills. Once you have reviewed this information, please document in the link provided, recommendations for the teacher, and additional resources needed. 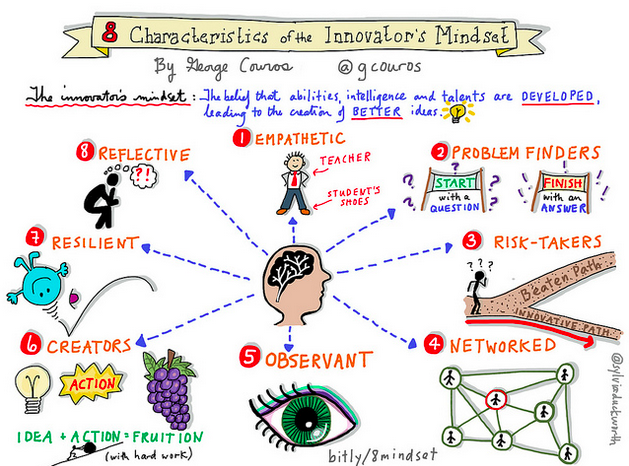 Using your Innovator's Mindset, how will you need to access the eight characteristics to assist in designing a blended learning model that fits the needs for your school (or supporting schools). Record your design thinking in the document below.